The Migration Advisory Committee (MAC) today raised major concerns about how the government’s proposed new temporary migrant worker programme to fill labour shortfalls on farms and food processing delivers “considerable control” to employers thereby posing a real risk of abuse. Focus on Labour Exploitation (FLEX) underlines these fears and has today published a briefing setting out how the proposed programme could leave many thousands at risk of serious exploitation unless key safeguards are adopted. Earlier this month the Government proposed to have 5,000 workers come on six-month visas to work on British farms over the next two years. 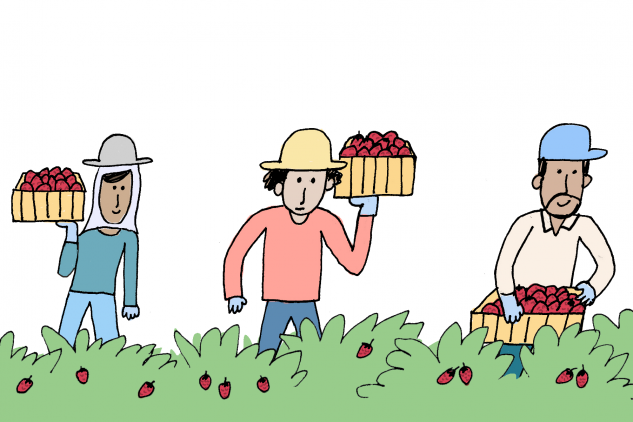 Lessons from the previous Seasonal Agricultural Workers scheme, which ran until 2013, is that temporary migrant workers are at risk of modern slavery because their visas are tied to a specific employer. This means anyone attempting to escape an exploitative situation could face deportation. Unscrupulous bosses use this power imbalance to threaten to fire workers who dare to complain. Migrant workers are also at risk of being scammed into paying foreign-based recruiters extortionate fees, which typically lead to heavy debts. These debts also increase the hold an employer has over the worker. To prevent such abuses becoming endemic in the British farming and food sectors it is vital that all temporary migrant workers are given the right to change employer, so workers do not face deportation for trying to escape an exploitative situation. Recruitment costs must also be covered by the employer and there must be credible oversight and enforcement of overseas recruitment agencies. It is also essential that employers are inspected by the Gangmasters and Labour Abuse Authority (GLAA) before gaining access to any new temporary migrant worker scheme. To discourage abuse all overseas recruiters must have a UK-based representative and can be held accountable for breaching of UK labour laws. Read FLEX’s briefing on this issue here.